Last night Ann and I caught this flick that I had previously DVRed and I was pleasantly surprised. This movie is one of renewed friendship.. it is a wonderfully acted tale of how we really need each other.. it is a moving peek into the grief of a man who lost everything on September 11, 2001.. it is one of the best movies on the journey of grief that I have seen. 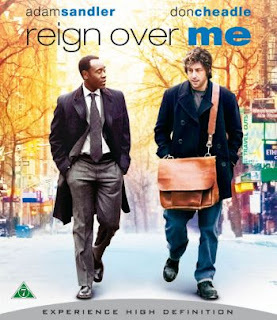 Adam Sandler and Don Cheadle give great performances and really capture the heart of their characters in a very nice way. If you have the dispsition for R-rated dialog and a heart for gut-wrenching grief I recommend this one to you.